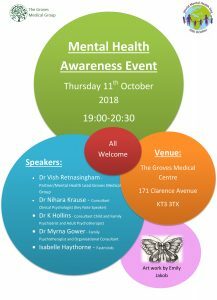 The Surgery will be hosting a Mental Health Awareness Event on Thursday 11th October 2018 between 19:30 – 20:30 pm. The event will take place at The Groves Medical Centre and will feature a number of speakers on the night. Please see the below links for further information.